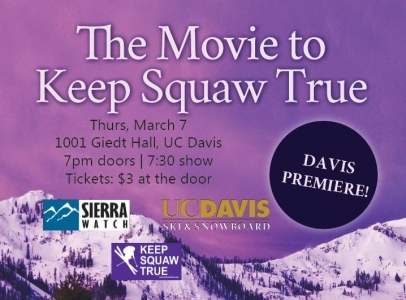 Thursday, March 7, join Sierra Watch for a very special screening of The Movie to Keep Squaw True at UC Davis! Hosted with the UC Davis Alpine Ski & Snowboard Team (DASS), this is going to be one great evening as we tell the epic story of the Squaw-skiing community rising up to defend the integrity of an incredible place! Tickets are $3 at the door with proceeds going toward DASS’s 2019 race season! Q&A with Director Robb Gaffney and raffle afterward! When private equity developers and their corporate henchmen came to Tahoe to transform Squaw Valley into a Vegas-style amusement park, they ran into a mountain of community commitment – the movement to Keep Squaw True. The movie tells the inspiring story of the ongoing seven-year struggle to stand up and defend Squaw Valley, Lake Tahoe, and the Sierra Nevada. The film was written and directed by brothers, Robb (Squallywood) and Scott Gaffney (Matchstick Productions), and was produced by Sierra Watch. It features an unforgettable cast of enthusiastic Tahoe locals and iconic Squaw legends as they show the world how to band together and stand up for their mountain values. So join with the UC Davis Alpine Ski & Snowboard Team, Thursday, March 7, at 1001 Giedt Hall at UC Davis! For information on other screening, check out our tour page! The Movie to Keep Squaw True: See it in December!